Boston: American Meterological Society, 1970. The subtitle of this volume is: A collection of addresses presented presented at a Joint Symposium Commemorating the Centennial of the United States Weather Services and the Golden Anniversary of the American Meteorological Society, Wahington, D. C. February 12-14, 1970.The principal topics (and number of papers) were: Expanding the Understanding of the Atmospheric-Hydrospheric System (7); Extension of Prediction Services to Meet New or Enlarged User Needs (12); and Expectations for Environmental Control (4). Although many of thre participants expressed optimism about the future of computer-driven forecasting models, not all were enthusiasts: "I forecast that there will be at least one new invention during the coming century, writes Edward Lorenz, whose impact upon meteorology will be comparable to that of the computer ... Beyond the the day of this invention I can no longer predict where meteorology will go, except that to say progress in some direction will be abundant." 170 pages, with Foreword. maps, charts, figures, and halftones; plus iv pages, Frontispiece, and Table of Contents; References at the end of most papers. DJ has pinprick at front gutter, and chips at rear upper corners; boards are clean and sound; text is strong and clean, though browning to margins.. Printed Blue Boards. Very Good/Very Good. 11 1/8 x 8 11/16. Hard Cover Monograph. New York: IEEE Press - Institute of Electrical and Electronic Engineers, 1984. Let's see if we can sort this out. In 1983 the IEEE produced two special issues, "Micron ansd Submicron Circuit Engineering," and "VLSI Design: Problems and Tools." The contents of those issues, with the exception of two un-named papers that were considered "too specialized for the envisaged broader readership," have been republished in this publication. Addtionally the co-editors, both associated with IBM, contributed an original paper each, to bring the final number of papers back to where it began. 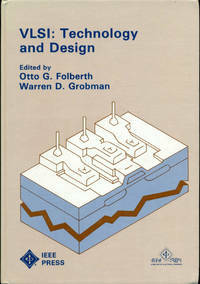 The 25 papers - 23 reprinted, two new - have been grouped under the following topics: Overview; Lithography; Devices and Processes; Micron and Submicron Circuit Engineering - Digital and Analog Applications and Results; Modeling and Simulation of Devices and Circuits; Design Methodologies and Testing of VLSI Chips; International Aspects; and Outlook. 309 pages, with tables, figures, half-tones, Author Index, Subject Index, and Editor's Biographies; plus ix pages, Contents, Preface, and (editors') Foreword; References at the end of each paper. Covers insignificantly bumped at lower corners, otherwise clean and sound; text is clean and strong.. Illustrated Coated Boards. Very Good/No Jacket. 10 1/4 x 7 3/8. Monograph. Madison, WI: University of Wisconsin Press, 1986. Proceedings of a symposium held at the Wisconsin Clinical Cancer Center in 1984 entitled "Estrogen and Antiestrogen Action: Basic and Clinical Aspects." 29 papers by 77 contributors are organized into 8 general topics: Chemistry and Biochemistry; Antiestrogen Building Sites; Pharmacology; Laboratory Models to Study Hormone-Dependent Breast Cancer; Hormone Receptors: Clinical Applications; Antibodies to Steroid Hormone Receptors; Advanced and Adjuvant Breast Cancer Therapy; and Summary. 535 pages with tables, figures, halftones and Index; plus Contents, (list of) Contributors, Preface and Acknowledgements. Covers are clean and sound; numerous gift notes to prior owner and evidence of removed bookplate on front EP; text is clean and strong.. First Printing. Maroon Cloth. Very Good/No Jacket. 9 1/4" Tall. Hard Cover. (Sacramento): California Department of Fish and Game, 1990. Text/BRAND NEW. Gray soft cover/NF. PO name to upper text edge. This is the publisher's Fish Bulletin 174. It is the result of a symposium in 1989 in which a number of researchers, previously uncoordinated, gave papers on their halibut observations. Sessions were scheduled for "1) Habitat, Distribution, and Early Life History; 2) Adult Life History; 3) Fisheries; 4) Recreational Histories; and 5) Management, Population Dynamics, and Fisheries Interactions." 26 papers, 475 pages, with Table of Contents, Tables, Maps, and figures; Abstracts at the beginning of all papers, Discussions, Acknowledgements and Literature Cited at the end of most papers.. Printed Cardstock. Very Good/No Jacket. 9" Tall. Monograph. New York: Plenum Press, 1968. This Symposium represents the proceedings of the fourteenth Easter School in Agricultural Science (Nottingham: 1967). The mammals of the title are domesticated farm animals (sheep, pigs, and dairy and beef cattle). The major topics (and number of papers) are:Tissue Growth (4); Hormonal Influences (3); Prenatal Development (2); Postnatal Development (4); Genetic Influences (3); Nutritional Influences (3); Carcass Quality and Assessment (3); and Practical Implications of Factors Affecting Growth (3). 527 pages, with tables, figures, halftones, List of Members, Author Index, and Subject Index; plus xi pages Contents, Preface, and Acknowledgements; References, and Discussions at the end of each paper. DJ slightly grimed at edges, otherwise sound; boards are clean and sound; text is clean and strong.. Printed Green Boards. Very Good/Very Good. 8 3/4" Tall. Hard Cover Monograph. New York: Marcel Dekker, 1997. This is a volume in the publisher's series INFECTIOUS DISEASE AND THERAPY. 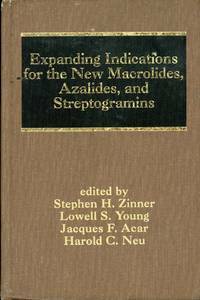 It records the proceedings of the "Third International Conference on Macrolides, Azalides, and Streptogramins (ICMAS III) [which] was held January 24-26, 1996, in Lisbon, Portugal. This meeting attracted over 1300 scientists, physicians, and clinical investigators from all over the world. The program included state of the art lectures, round table discussions, eight workshop symposia, research updates from industry, and over 300 poster presentations. SInce the first ICMAS meeting in January, 1992, enormous progress has been made in the research and development of new compounds and their application to clinical medicine. The volume includes plenary papers, summaries of the workshop symposia, and selected extended abstracts from the meeting." Fourteen papers are taken from the Plenary Sessions, and eight from the workshops, The expanded abstracts cover 15 topics, and include one to fourteen papers each. 694 pages, with tables, charts, photographs, Author Index, and Subject Index; plus xxi pages Series Introduction, Preface, Contents, and Contributors; References at the end of each paper. Covers are sound, but show ink loss on lettering; text is strong, but slightly grimed at edges.. Second Printing. Printed Brown Boards. Very Good/No Jacket. 9 1/4" Tall. Hard Cover Monograph. New York: Academic Press, 1964. ISBN subsequently assigned. Fifty-four authors presented 33 papers at this symposium. A few titles (and lead authors), will give a sense of the whole: Triplet States in DNA (Isenberg); Electrical Conduction in Solid Proteins (Eley); Electron Transport through Conjugated Systems (Orgel); Intermolecular Forces in Biological Systems (Salem); and Electronic Aspects of Pharmacology (Pullman). 582 pages, with Opening Remarks (Wurmser) tables, figures, halftones, and Subject Index; plus xiii pages, List of Contributors, Introduction, and Contents; References at the end of each chapter. Covers are grimy, with bent leading corners and flattened backstrap ends; inked name and stamp of prior owners on rfEP; text is strong, but browning at edges, and has inked dot on leading edge.. Grey Boards. Very Good/No Jacket. 9 1/4" Tall. Monograph. Ames: Iowa State University, 1986. 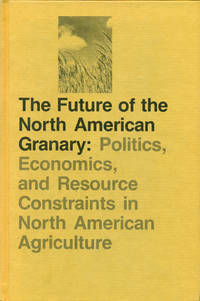 The proceedings of a conference jointly sponsored by the University of Minnesota Department of Agriculture and Applied Economics and the Hubert H, Humphrey Institute of Public Affairs. The focus was the "grain sector of North America, stretching geographically from the Ohio Valley to the wheat-growing region of the West, north to the Great Plains of Canada and east across the Prairie Provinces to the upper Great Lakes region." The principal topics were: The Politics and Economics of North American Grain Production; Climate Change and Great Plains Agriculture; Resource Constraints to Grain Production; and The Future: Technical and Institutional Innovation in North American Agriculture. Cleveland, Freeman, Goldberg, Schuh and Schwinden were among the participants. 16 chapters, 238 pages, with tables, figures, charts, maps, a half-tone, and Index; plus Contents, Introduction and Overview, Acknowledgements, and Contributors; References at the end of each paper. Covers are sound; text is clean and strong.. First Edition. Printed Boards. Fine/No Jacket. 9 1/4" Tall. Hard Cover. New York: Plenum Press, 1966. 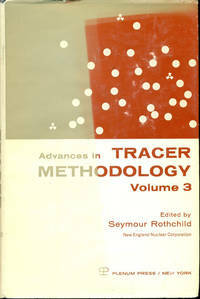 This is a publication of the New England Nuclear Corporation, and represents a "collection of papers presented at the Ninth (10/23/64) and Tenth (3/25-27/65) Symposia on Tracer Methodology." The major subjects are Preparation of Labeled Compounds (8 papers); Specific Analytic Techniques (including Liquid Scintillation Counting (5); Autoradiography (4); and Chromatography (3)); Biochemical Applications (7); Clinical Applications (5); and Health Physics (1). Thirty-three papers, 333 pages, with tables, figures, halftones, and Index; plus Preface and Contents; References at the end of each paper. DJs are faded, with one chip and one tear, and pitted at backstrap and front left; boards are clean and sound; text is clean and strong.. Blue Boards. Very Good/Good. 9 1/4" Tall. Monograph. Washington, DC: U.S. Government Printing Office, 1966. Proceedings of the Convocation that occurred on Wednesday, 4 May 1966 at the Departmental Auditorium, with the editor as Chairman. Among the contributors to the occasion were John S. Foster, Jr., Admiral Horacio Rivera, Dr. Allan T. Waterman, who recived an award, Sir Solly Zuckerman, and Paul H. Nitze. Three speeches were given in honor of the ONR's twentieth birthday, and four more given on the subject of 'Science and Public Policy.' The keynote address that followed - by Nitze - was 'Perspectives on Naval Research.' 133 pages with Contents, Program, and Foreword. Covers show light shelf use; name of prior owner inked on lfEP; text is clean and strong.. Cloth. Fine/No Jacket. 9 3/8" Tall. Hard Cover. New York: AIP - American Institute of Physics, 1991. "This volume is a collection of papers oresented at the Fourth Annual Conference on Superconductivity and Applications ... The field of high-T(sub c) superconductivity is gowing so rapidly that it is difficult to keep up with the literature. An open meeting like the Buffalo Conference serves the purpose of helping keep researchers abreast of important progress being made around the world." The presentations are organized as follows, Plenary Reviews (by Lee, Goodenough, Dynes, Cava (et al. ), and Teller); Fundamental Properties (26 papers); Thin Films and Synthesis (38); and Applications (6). 713 pages, with tables, charts, photographs, Subject Index and Author Index; plus xi pages Contents, and Preface.Covers are slightly grimed, and pushed at front lower leading corner and rear upper leading corner; text is strong. but slightly grimed on leading edges.. Printed Taupe Boards. Very Good/No Jacket. 9 1/2 x 6 1/2. Hard Cover Monograph.